A puzzler with a unique twist. 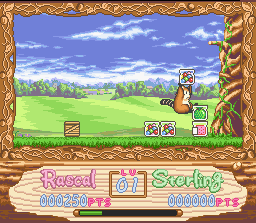 Rather than being another Puyo Puyo / Tetris rip-off, you control a raccoon who must match 3 (or more) like jars by way of arrangement. Keep in mind it’s not like Tetris Attack. Here you’re restricted by obvious obstacles whereas in Tetris Attack you’re free to move the cursor where you wish. It’ll take a few minutes to get the hang of, but then the good times roll. The little squirrels pushing the jars down add a nice touch. 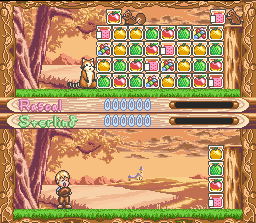 As you can see, Rascal just connected 3 green jars. 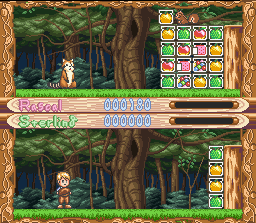 Pulling off chains is more difficult here than in other puzzle games, so it’s double gratifying when you get one down. Rascal is an endearing little guy. 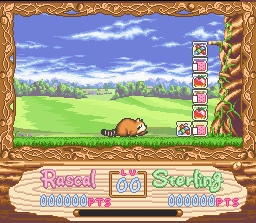 When he’s not carrying a jar and moving, true to raccoon form, Rascal scampers low to the ground. When carrying a jar, he marches along erect holding the jar high above his head with his diminutive arms. Awww. 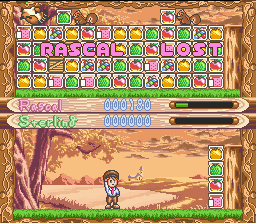 When Rascal has a jar he has the option of dropping it beneath him, or throwing it one column over. He can also jump and swipe jars high above his head; as well as push jars provided they’re out in the open. If a jar is dropped on his noggin, it results in this amusing animation. The 1 player mode is fine and dandy but like any puzzle game worth its weight (sans Tetris of course), it’s all about the two-player mode(s). 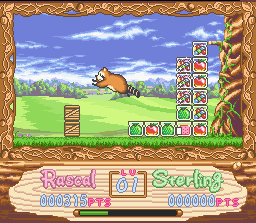 Raccoon Rascal has three unique 2 player modes. 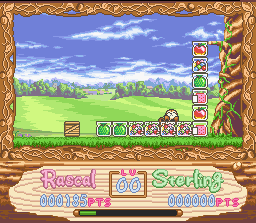 The first is a side scrolling platform-y race-to-the-exit-as-fast-as-you-can split screen affair, where jars are placed strategically to impede players’ progress. This mode is a thrilling race-against-your-opponent-while-you-rack-out-your-brains kind of rush. 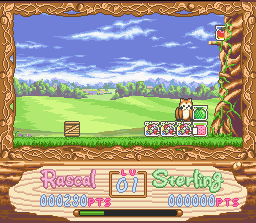 The second is the full screen cooperative mode. If you’re not in a competitive mood this mode serves its purpose well. 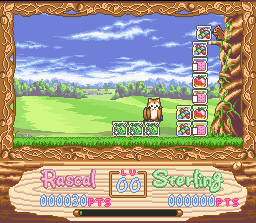 The third final option is the classic head-to-head split screen mode. 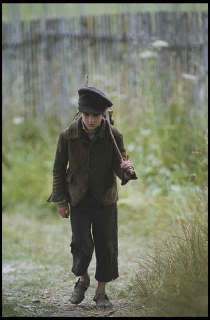 Player 2 controls a boy named Sterling who bears more than a passing resemblance to Oliver Twist. We all know the story don’t we. Boy meets raccoon. Raccoon bites boy. Boy challenges raccoon to life-or-death puzzle duel. It was a time of pain and destruction. It drove boy and raccoon to the very brink of madness. NOW, their final battle commences. This is the timeless tale of raccoon vs. boy. Let’s see how this new classic story for future generations unfolds. 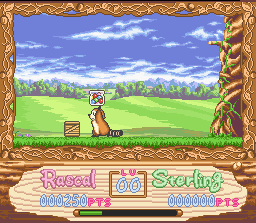 What happens when you pit a hard working raccoon against a lazy boy who stands there like a bump on a log? Let us observe this intense battle of wills and wits. Hard work pays off, Jimmy! Now Jimmy see here, the raccoon busts his little behind while the boy naps. Now observe what happens and why hard work pays off. Even Sterling has no clue how he won! I mean just look at the lad! Sigh. Super Play put it well. This is a puzzler that gets better as you delve into its various tactics and techniques. Somewhat meh at first but quickly becomes highly charming and effective. 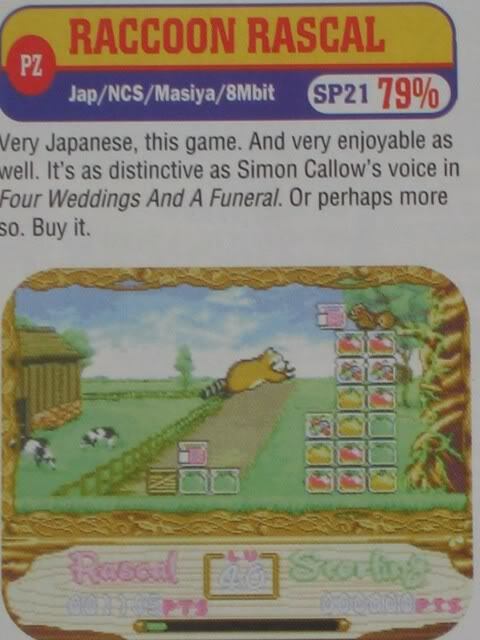 I also like that it’s different from your typical falling piece puzzle game. 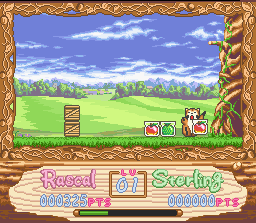 There’s a little action platforming element to it as you must maneuver Rascal around the field, running, jumping, grabbing and throwing. It adds an extra layer to the traditional puzzle format and makes for a good time. The three different two-player modes also add a lot of replay value and depth to an already very good game. 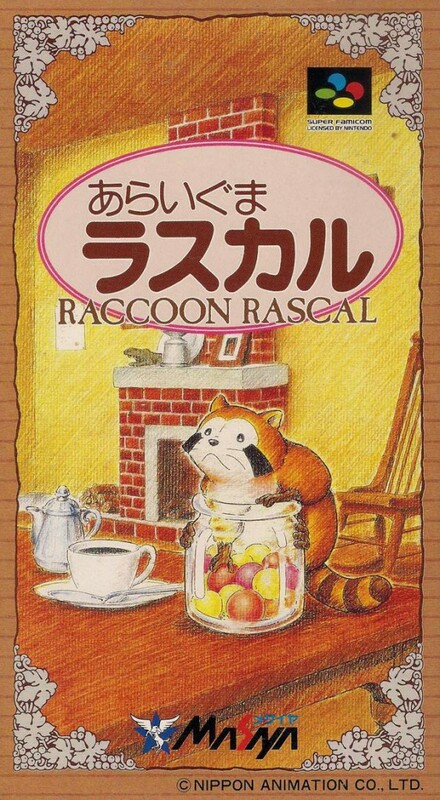 Araiguma Rascal (or Raccoon Rascal) is a must-have for any diehard Super Nintendo connoisseur. Don’t miss out on it!